Gun Violence And Mental Health Laws, 50 Years After Texas Tower Sniper : Shots - Health News Trying to prevent gun violence by tying it to mental health legislation began in 1966 when a young gunman killed 16 people in Austin, Texas. But some believe the approach is misguided. 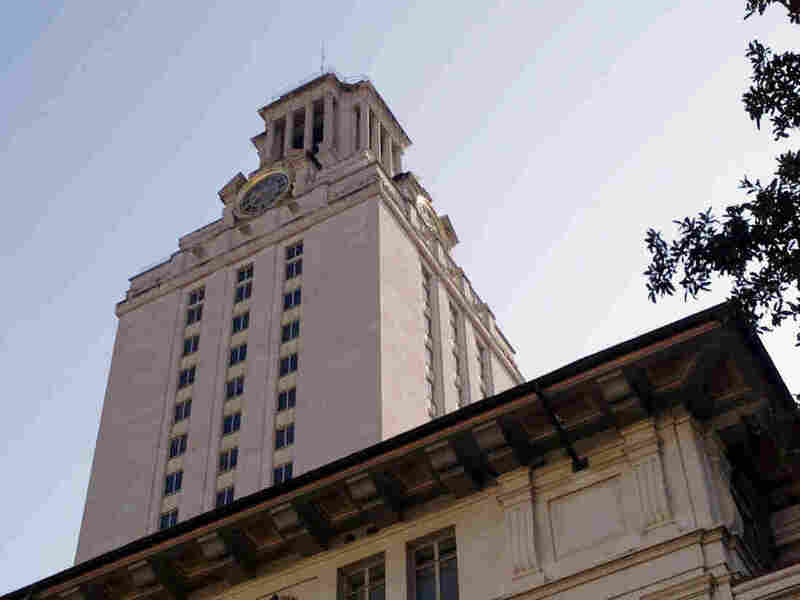 The 307-foot tower at the University of Texas at Austin was the site of mass murder 50 years ago Sunday. For some people, the attack on police officers by a gunman in Dallas this summer brought to mind another attack by a sniper in Austin 50 years ago – on Aug. 1, 1966. That's when student Charles Whitman stuck his rifle over the edge of the clock tower at the University of Texas and started shooting. Ultimately, he killed 16 people — and wounded more than 30 others. 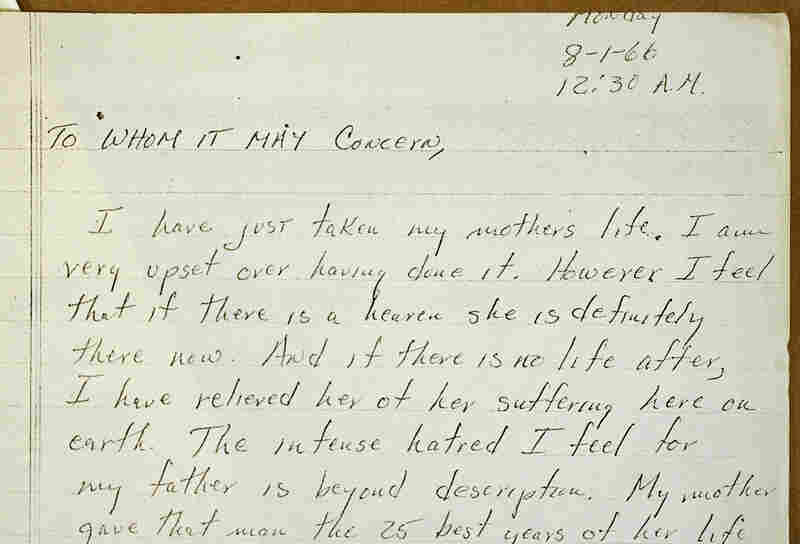 Charles J. Whitman, a 25-year-old student at the University of Texas in 1966, killed his mother and wife before unleashing a barrage of bullets from a tower on the campus of the University of Texas at Austin. Six months before Whitman took aim from that tower, he visited a school psychiatrist and admitted while there that he had a violent fantasy of going to the top of the tower with a deer rifle and shooting people. Gary Lavergne, who wrote A Sniper in the Tower, says the school psychiatrist, Dr. Maurice D. Heatly, claimed he'd had many students who recounted violent fantasies during therapy sessions. "Today we take it a whole lot more seriously because of our history," Lavergne says. "But back then, that kind of thing didn't happen." "It's a common experience for students who come to the mental hygiene clinic to refer to the tower as the site of some desperate action," Heatly told reporters. "They say 'I feel like jumping off of the old tower.' 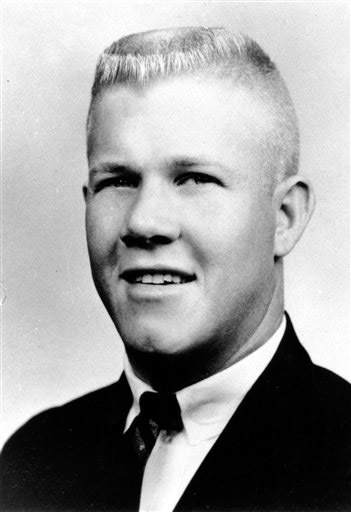 [Charles Whitman had] no psychosis symptoms at all!" Whitman never went back to the clinic but did return to his violent fantasy. Lavergne says the 25-year-old Marine veteran and Eagle Scout was incredibly methodical as he went about killing his mother the night before the tower shootings, placing her body in bed as if she were sleeping. Then he went back home and stabbed his wife. 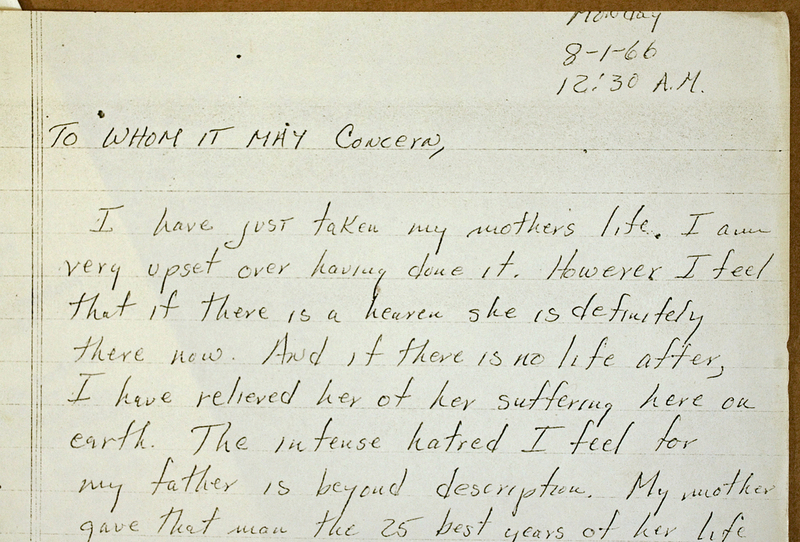 The night before the tower shootings, Charles Whitman killed his mother in her bed, and left this note. "By 3 o'clock in the morning, his wife and his mother are both murdered," says Lavergne. "After that, until he goes to the campus, he spent the rest of his time polishing, getting weapons ready, buying more ammunition. All for the specific goal of going to the top of the UT tower and shooting people." Nearly two hours later, 16 people were dead all-told, and 32 more were wounded. Police finally killed Whitman. "Of course I am concerned, disturbed, and yet somewhat at a loss to know how you prevent a maniacal act of a man who obviously goes berserk," Connally said. Fifty years later, when news about shootings in Dallas, in Orlando or San Bernardino hits, our reactions are much the same. We use different words, but we often assume the shooter is mentally ill, and that crimes like this could be avoided if those with serious mental illness didn't have guns. As to the first question, Lavergne doesn't think Whitman had serious mental illness. Whitman, he says, did have mental health challenges that are common – depression and anxiety. But more than anything, he was manipulative. "He was always who he was expected to be," Lavergne says. "In front of his father-in-law he at times appeared to be a dutiful husband, when — in fact — he assaulted his wife, just like his daddy assaulted his mother. And he gave people the impression he was an honor student, when — in fact — when he died he had a 1.9 grade point average." "I don't really understand myself these days," he wrote. "I'm supposed to be an average, reasonable and intelligent young man. However, lately, I can't recall when it started, I have been a victim of many unusual and irrational thoughts. These thoughts constantly recur." Whitman didn't mention he'd also been abusing amphetamines. The potential impact of those chemicals fizzled out of the public conversation as soon as a pathologist made a striking discovery in his autopsy: a brain tumor. One doctor said the "grayish yellow mass" wasn't a factor in explaining what Whitman had done. But a medical panel later diagnosed the mass as a glioblastoma and said it could have contributed to Whitman's inability to control his emotions and his actions. Dr. Elizabeth Burton, a Dallas pathologist, agrees it's possible. "You can have headaches, you can have seizures, and you can have changes in cognition, and you can actually have personality changes," she says. But plenty of people have tumors and are not violent. And plenty of people have depression, anxiety and paranoia and aren't violent. Dr. Paul Appelbaum, a psychiatrist and director of the division of law, ethics, and psychiatry at Columbia University, points out that only a tiny percent of violence – about 4 percent in the U.S. — is attributable to mental illness. "We know that people with serious mental disorders are at somewhat elevated risk of committing violence," Appelbaum says. "Even so, the vast majority of them never commit a violent act. And we know that people with serious mental illnesses are much more likely to end up as victims of violence rather than as perpetrators." But Democrats and Republicans both tout mental health care legislation as a way of preventing mass shootings. After a shooter killed 20 children in Newtown, President Obama called for a gun crackdown. That didn't happen. But, Obama's 2017 budget does include $500 million for mental health services. Appelbaum says this is a misguided approach. "We need more funding for treatment of people with mental illness in this country," Appelbaum says. "But to argue for that funding on false grounds — namely to try and persuade the public that it will protect them [to] have more mental health clinics — in the long run can only backfire." Applebaum believes there are alternatives. He says at least temporarily limiting access to guns for some people make sense. In general, people who have been convicted of violent misdemeanors, or who are a under temporary restraining order, or who have multiple DUI convictions over a 5-year period are more likely to commit acts of violence than people with mental illness are. This story is part of a partnership with NPR, local member stations and Kaiser Health News.